We are now almost three weeks in, and the structure of the term is starting to reveal itself. Firstly I have Wednesdays and Friday mornings off, which makes my week very on-off intense, with nine ‘til six on a Monday and nine ‘til five on a Tuesday and then a day of pure pure rest. I have fewer lecture courses than last term to add to the relaxation—Sun, Stars and Planets, Electromagnetism and Atomic Physics, which you should read as interesting, awesome and evil respectively. Electromagnetism is—surprisingly—my outstanding favourite so far this term. Last year I found it confusing and struggled with the many different equations which I couldn’t seem to make a coherent framework out of in my head. This year, so far, it has been completely inspiring. The equations are now all vector-y and there are divs there and curls here and I still think vector calculus is like magic, so it it surprises me every time that the curl of a vector field coming out through a surface (like the turning force of water out of a tap) can be described by integrating for the field around a closed loop around any boundary curve (and I mean ANY boundary curve). That is a very ‘touchy-feely’ version of Stokes’ law by the way, as my EM lecturer would say. That’s another thing—the lecturer we have is amazing! His notes are compact and well-written, his jokes are funny, his way of explaining complex things makes them seem so, so simple that you actually want him to hurry up because something exciting might happen, like the wave equation dropping out of Maxwell’s equations with c in place of the velocity, and oh look we’ve discovered electromagnetic waves. Sigh. Professor Steven Cowley is his name and as well as being a great lecturer he is also quite a cool man—in fact he is Director of the Culham Centre for Fusion Energy, has his own TED talk, and was voted the 81st most influential man in the country by GQ-magazine last year which is awesome, if problematic if he spots you googling him in lectures. Atomic Physics is this course’s antithesis. It does, in fact, follow on from the quantum course of last term, which is enough to make me shiver, but it also adds lots of nasty things like wrong models of the atom that are partially right and lots and lots of things concerning angular momentum and lists of solutions to equations that look suspiciously like solving them yourself would make you go mad and end up quitting to become a soothsayer or a homoeopathist or something. Outside of lectures, some good things have happened like stuffed aubergines, watching Breaking Bad as a house and cycling on the newly installed Boris bikes all around Fulham, and some bad things too, like spending hours on hold to British Gas and then having to talk to someone from British Gas about gas and stuff. To follow up on the lab post from the other day, I now have all my data collected, and am proceeding to bash my head against the analysis. 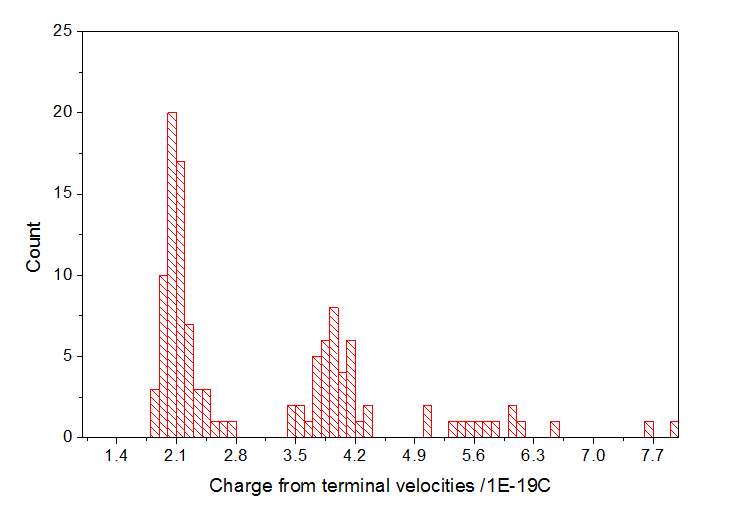 Here is a histogram—the first two little peaks which are teasing me by looking a little tiny bit like they might turn out to be nice Gaussian distributions, are—fingers crossed—showing the number of oil drops with one times and two times the charge of an electron on them. At one point in my analysis it looked like I was about to live up to my blog tagline and have well over a hundred percent uncertainty… but now…we shall see!